Some species of bacteria perform an amazing reproductive feat. When the single-celled organism splits in two, the daughter cell - the swarmer - inherits a propeller to swim freely. The mother cell builds a stalk to cling to surfaces. University of Washington (UW) researchers and their colleague at Stanford University designed biosensors to observe how a bacterium gets the message to divide into these two functionally and structurally different cells. The biosensors can measure biochemical fluctuations inside a single bacteria cell, which is smaller than an animal or plant cell. During cell division, a signaling chemical, found only in bacteria, helps determine the fate of the resulting two cells. The signal is a tiny circular molecule called cyclic diguanosine monophosphate or c-di-GMP. By acting as an inside messenger responding to information about the environment outside the bacteria cell, c-di-GMP is implicated in several bacterial survival strategies. In harmless bacteria, some of these tactics keep them alive through harsh conditions. In disease-causing bacteria, c-di-GMP is thought to regulate antibiotic resistance, adhesiveness, biofilm formation, and cell motility. 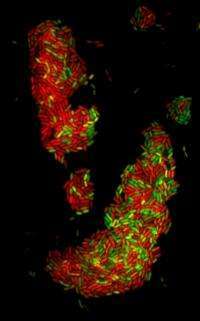 In their study, the UW-led team of scientists looked at cell division in a species of disease bacteria that fends off treatment and establishes a stronghold by using these defenses, Pseudomonas aeruginosa. This is the rod-shaped pathogen that causes life-shortening, chronic lung infections in people with cystic fibrosis, burns, and suppressed immune systems associated with cancer. The researchers also examined cell-division in a harmless lake and stream dwelling bacteria, Caulobacter crescentus. The researchers' findings will be published in the June 4 Science. The senior author is Dr. Samuel Miller, UW professor of medicine, microbiology, immunology, and genome science. Miller directs the Northwest Regional Center of Excellence for Biodefense and Emerging Infectious Diseases Research. The lead author is Dr. Matthias Christen, a UW postdoctoral fellow in immunology who has moved on to become a faculty member in the Biozentrum at the University of Basel, Switzerland. To monitor the concentration of c-di-GMP within single living bacteria cells, the scientists developed a biosensor based on genetically encoded fluorescence resonance energy transfer. C-di-GMP exerts control over several biological functions inside the cell by linking up with a diverse array of receptors. These include proteins required to build and drive waving, hair-like structures for moving cell. These also include riboswitches - RNA molecules, transcription factors and proteins --that can alter gene activity. Because C-di-GMP controls many different cell functions, the researchers believed it was highly likely that it manages its regulatory workload by appearing in the right amount, in the right place, at the right time in the cell cycle. The researchers found that, immediately after a thin partition formed creating two distinct cells, the levels of c-di-GMP were low in the cell propelled by the whipping flagella and five times higher in the non-motile stalk cell. This asymmetrical distribution of the regulatory messenger occurred in both species of bacteria and was not an isolated event. "In both organisms," the researchers noted, "c-di-GMP levels were always significantly lower in the flagellated cell than in the non-flagellated cell." Some of the enzymes that sense the c-di-GMP messages are place-bound in distinct locations of the cell. The researchers reasoned that the unequal distribution of the messenger c-di-GMP might be caused by the spatially restricted production or activation (or inactivation) of these enzymes. The researchers found that strains of bacteria that produce more of these enzymes in the swarmer cell also had higher concentrations of c-di-GMP in the swarmer cell, suggesting that a localized drop in the enzyme activity would likely result in a localized drop in c-di-GMP. Impairing the cellular distribution of c-di-GMP, the researchers noted, has major consequences for the development and function Caulobacter cells. Mixing the balance of the sensing enzymes would lead to a swarmer cell that couldn't swim or to a hypermotile swarmer cell, depending on how the balance of enzymes is tipped. The normal drop of c-di-GMP might also spur rapid take off of the swarmer as it swims away from its mother cell. Less than an hour later, the swarmer can no longer swim, and reverts to a stalk cell. The researchers have also used the biosensor they developed to study the multi-flagellated Salmonella enterica, which causes food poisoning, as well as the non-flagellated Klebsiella pneumoniae, an air-borne lung pathogen. Both of these bacteria also have uneven distribution of a key internal messenger during cell division. "This suggests that this phenomenon is not unique to Pseudomonas and Caulobacter," the researchers surmised, "and that cell properties other than motility are likely to be regulated by asymmetrical second-messenger distribution during cell division." The asymmetrical distribution of c-di-GMP observed during cell division, the researcher added, may be an important regulatory step in making and powering nano-scale tools on the outside surface of the cell to carry out essential activities.